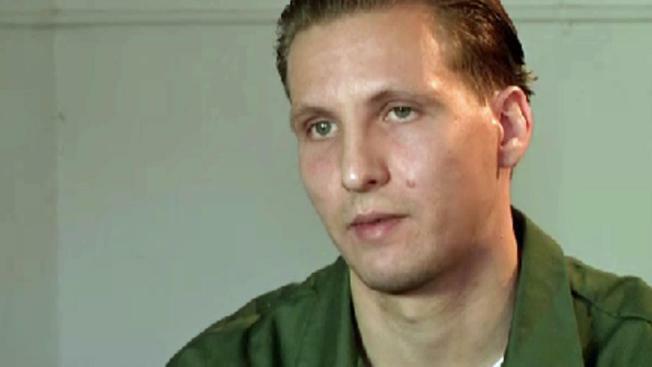 John Giuca's 2005 murder conviction in the killing of a college football star was recently overturned by an appellate court but now prosecutors are digging in their heels, saying Tuesday they will try to get his conviction reinstated and may retry him. Sarah Wallace reports. John Giuca's case had more twist and turns than a Hollywood movie. Giuca's 2005 murder conviction in the killing of a college football star was recently overturned by an appellate court but now prosecutors are digging in their heels, saying Tuesday they will try to get his conviction reinstated and may retry him. The judge denied bail for Giuca, and he was returned to Rikers. Giuca is serving a 25-years-to-life sentence for the death of Mark Fisher, a 19-year-old New Jersey college student and football star whose body was dumped in a Brooklyn driveway after a night of partying in 2003. A judge has upheld the murder conviction of New York City's so-called "grid kid slayer," months after a key witness in the man's trial admitted to lying on the stand about the decade-old killing of a New Jersey college student. Sarah Wallace reports. “Every day is hell. If you can imagine the worst day of your life and now imagine reliving that day every day for the past 11 years, that’s what it feels like,” Guica told the I-Team in 2015 from Clinton Correctional facility, near the Canadian border. The key witness at the trial for the prosecution was John Avitto, a man with a long drug history. Giuca’s attorney, Mark Bederow, claimed prosecutors misled the jury and withheld information that would have diminished Avitto’s credibility. Avitto, a self-described bipolar career criminal who originally testified for the prosecution, switched sides in 2015 and claimed that he made up the accusations that sent Giuca to prison for the Brooklyn murder. A judge upheld the murder conviction of New York City's so-called "grid kid slayer," months after Avitto admitted to lying on the stand. However, Giuca has always maintained his innocence, but Brooklyn prosecutors painted him as a wannabe gang thug who gave his friend Antonio Russo a gun and told him to shoot Fisher. Giuca’s case also gained attention after his mother, Doreen Giuliano, went undercover following her son's conviction. She dyed her hair and took on a new identity to try to seduce a male juror. For months, she recorded their conversation as they became good friends. John Giuca is trying to get his conviction overturned after he was found guilty of second-degree murder in the 2003 death of Fairfield football player Mark Fisher. Now a star witness in the trial says he lied. I-Team’s Sarah Wallace first highlighted this case last week in a jailhouse interview with Giuca. Giuliano later said she found juror misconduct, but a judge would not consider her tapes as evidence and instead lambasted her for the undercover scheme.